Mint and Liberty. Open daily, 8am to 8pm. 19101 Hwy. 12, Sonoma. 707.996.5949. mintandliberty.com. AT LIBERTY Something snazzy's going on in the old Breakaway Cafe space in Sonoma. The town of Sonoma boasts several distinguished restaurants, among them the Girl and the Fig, Cafe La Haye, El Dorado Kitchen and LaSalette. They're all on, or very close to, the town plaza. Sonoma Valley also has its share—most notably the Fig Cafe & Winebar and Salt and Stone. What's been missing from the area since the closing of the Breakaway Cafe is a destination restaurant that's midway between the plaza and "up valley." Now there's a new resto in the old Breakaway space. Mint and Liberty is a departure from the Breakaway's comfort-food mantle. The space has been completely reimagined and remodeled, and Jacqui Sweet deserves a lot of the credit for the new look. Sweet is a Sonoma County native and graduate of UC Berkeley; this is her first restaurant project. "The biggest challenge in redesigning the Breakaway," Sweet says, "was trying to create a space that is welcoming and inviting for Sonoma locals and out-of-town visitors." 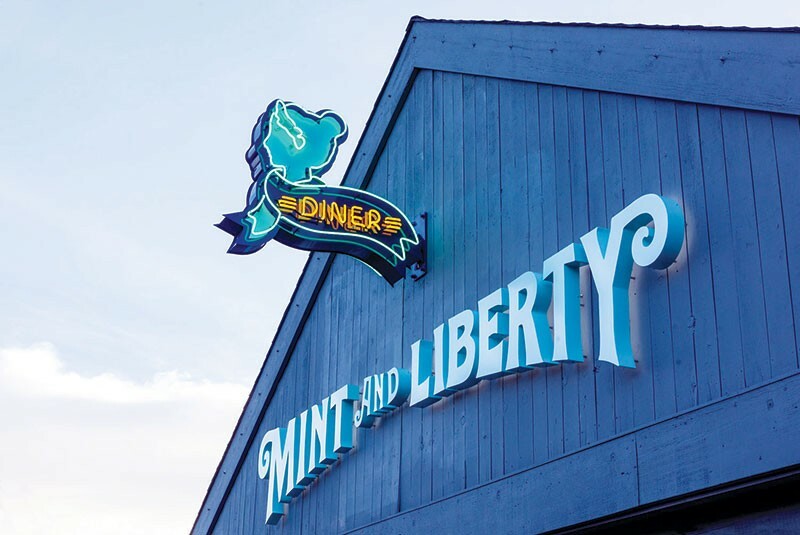 If ever a restaurant in Sonoma deserved to be called politically correct, it's Mint and Liberty. Almost everything about the restaurant, including the meat and the produce, is local and organic. The place is committed to diversity and the empowerment of women. The restaurant bills itself as "a modern twist on a classic diner," and the menu is divided along the compass rose from West to East to North to SXSW. No detail at the bar, in the dining room or in the kitchen is left to chance. In the diner tradition, breakfast is available all day. After 5pm, several dishes, including a New England clambake, are served family-style and can feed two ravenously hungry individuals, or a family of four. Head to the west for a sprouted-lentil salad and pork-belly steamed buns. To the east there's a mini Jewish deli featuring chopped chicken liver and matzo ball soup, and a Reuben, though here it's called a Rachel and features housemade American Wagyu pastrami, coleslaw, Swiss cheese, and Russian dressing on rye bread. Head north for baked beans, potato pierogi, Chicago-style hot dogs, and beef stuffed cabbage rolls. The SXSW orientation features barbecue back pork ribs, shrimp gumbo and New Mexican enchiladas, which are served with a fried egg, avocado and cream. Executive chef Michael Siegel, who previously cooked at Shorty Goldstein's in San Francisco, "started with a conventional menu," he says, "then I played around. A diner is a quintessential American place—though we do take liberties. After all," he adds, "Mint and Liberty is modern." Siegel's wife, Katelin, notes that of all the dishes in her husband's repertoire, her favorite is the Vietnamese cha ca la vong (a fish dish prepared with dill and turmeric, which the late Anthony Bourdain helped to popularize on Parts Unknown). It's not on the menu now, put could pop up someday in the Far East section. There are nine beers on tap—including HenHouse Saison and Bear Republic Racer 5 IPA—and lots of sparkling wines, whites, reds, rosés and spirits, including a Stout Barrel Whiskey from the Griffo Distillery in Petaluma. The restaurant feels snazzy in a down-home Sonoma kind of way. It's a place to splurge on a big meal with family and friends—or to hunker down by yourself with a grass-fed-beef burger with all the fixings and a Lagunitas IPA. "We like food that [you'll] want to eat when you've worked up an appetite," says Hahn.